If one thing unites the left of all shades right now its a sort of satisfaction that the market has been shown to fail dramatically if not yet apocalyptically. On the left there are broadly three responses. The first is social democratic or Keynesian, of which Krugman, Henwood or Monbiot are examples. The second is radical, such as that of the Monthly Review School and many others who call themselves ‘socialist’, and the third is what I would call classic Marxist; Marx, Lenin and Trotsky of course, but also others like Paul Mattick who lived through the 1930s depression, David Yaffe in the 1970s and Anwah Sheikh today. We can call these standpoints Keynesian, Radical and Marxist for short. Each has a theory of how the capitalist economy works and as a result a theory of crisis and crisis solutions. All three are attempts to rectify what they see as the shortcomings of neo-classical, or what Marx called vulgar, political economy. As Mattick notes (in Marx and Keynes p.20) Keynes was hardly a revolutionary. In fact he could be said to have “partially” returned to the classical theory of Adam Smith in which labor produced value. Keynes did not think that the market could establish an equilibrium between consumption and production without state intervention. Say’s Law that supply creates demand did not work in reality and capitalists would tend to hoard rather than invest in production to meet demand. Only the intervention of the state to boost consumption would stimulate production, and that too would have to be pump primed by state investment to start. For Keynes then the business cycle was a thing of the past and could be eliminated by judicious state policies to balance consumption and production. This does not mean ideally building pyramids in Eygpt or military expenditure, since these do not normally increase workers incomes and consumption. Keynes policies were designed to transfer income from the savings of employers to the consumption of workers. This is why social democracy has seized on Keynes and applied it where possible, drawing on the lessons of the New Deal and Labour Governments in UK, Australia and NZ. A good example of that is George Monbiot’s call for a return to Keynes. Today the response of social democrats to the financial crisis is to jump at the opportunity to redirect social spending at increasing the incomes and hence consumption of workers. However the sheer scale of the crisis has taken them by surprise and they have been overwhelmed by the banks and goverments spending pontentially many trillions of dollars to stave up the collapsing financial system. Calls for social spending on jobs, wages and consumption have been lost in the rush to bail out the banks. Social democrats have a problem. They know that state spending on the banks and big corporates does not necessarily mean more production since there is no matching consumption. The bailing out of the banks could end up being hoarded. The logic of Keynesianism is therefore to take ownership of the banks or to found state banks to ensure that productive investment takes place. This however would end up in the state regulating and even owning production itself. Yet social democrats have not seized the time to demand complete nationalisation of the economy. Why is this? Henwood in my view is not a Marxist, but a left Keynesian. His claim that “If the credit markets could not function properly, the economy would grind to a halt and cause immense suffering to those who could least afford it” is clearly false, since it is being shown to us every day since August 2007 that the intermediation of the “credit markets” can be replaced by the direct financial intermediation of the state. Unfortunately, actual state intervention is being perverted into intermediation for the purpose of preserving the position of the financial sector in the economy rather than for the benefit of the economy as a whole, not even for the benefit of capitalist sectors excluded from the charmed circle of military-financial parasitism, much less for the rest of the population. up, their officers imprisoned and the remainder restricted to public utility functions. of the crisis, even in narrow capitalist terms. Henwood in his call to support the AIG bailout therefore is calling for a worsening of mass misery, not its alleviation. Henwood refuses to see that the immediate PROBLEM is that the advancement of “future wages” in the form of credit in lieu of actual wages earned (and actually stagnant and declining) – the “Payday Loan Economy” – has exhausted itself at the point where significant sectors of workers no longer earn actual wages to minimally pay the interest on this credit, resulting in a profit crisis for finance and a massive devaluation of financial capital. Reinflation of the balloon will not address this fundamental contradiction. again Henwood is to be found on the other side of the front line as it presently stands. This comment is interesting as it confirms the views of radicals and Marxists that the social democrats franchise is not to expropriate capital, merely to reform its workings. Radicals are summed up by the line from the Internationale: capitalists “steal” their profits from workers and the task is to take it back. But both radical and Marxists agree that Keynesian policies are designed to rescue capitalism from a crisis of excess capital by boosting consumption, not take over the banks and corporates. For that would be socialism! The radicals objection to neo-classical equilibrium theory goes beyond a rejection of Say’s law. Radicals argue that the accumulation of wealth in the hands of the ruling class is at the expense of the impoverishment of the working class. This theory goes back to a radical reading of David Ricardo the best political economist before Marx came along. Hence as wages are kept down to maximise profits, underconsumption is a chronic condition of the market and cannot be simply corrected by Keynesian policies. Because normally the ruling class controls the state boosting of jobs and incomes is always subject to their resistance to funding such a redistribution adequately. Of course radicals support Keynesian policies but say it is necessary to go further to nationalise the means of production so that it can be planned to meet the needs of consumption. Again, as with social democracy, the capitalist state is the instrument of this radical reform. Just as the welfare state redistributes income to boost consumption in the Keynesian system, the radical advocates state investment in industry to plan production. Thus the radical response to the current crisis is to push the state intervention to support the banks and corporates further to public ownership and control of finance and industry. For the Monthly Review School and many others including Robert Brenner and Noam Chomsky, public ownership of finance and industry would overcome the basic cause of the failure of the market – the tendency for capitalists to hoard their wealth unless they can drive down wages and conditions sufficiently to justify further investment. The social democratic solution is no solution for them because taxing their profits to pay a social wage prevents wages falling and profits rising. Given that understanding radicals go to the ‘root’ of the problem as they see it, the cause of inequality itself, the unequal exchange between capitalist and worker when the capitalist buys labour power below its real value. In the place of the capitalist the state steps in and in the name of the democratic people creates an equal exchange between labour and state capital. There is therefore no shortage of radicals calling for state bailouts of the banks to go further then state shareholding to complete nationalisation and control of the banks. Similarly, as big corporates like Ford, General Motors and Chrysler start to fall over, the call is for these firms to be nationalised. This call is now being made as the banks being bailed out by the taxpayers (whose taxes draw on future labor) refuse to themselves bail out bankrupt firms. Example: Republic Windows in Chicago occupied the plant to get their redundancy from the bailed out Bank of America. They won and are now reemployed by a new boss. What is at issue here is workers using direct action to force the employer to shell out some of the public bailout money. Its about getting what is ‘fair’ and not about workers control of production! While workers limit their actions to pressure the nationalisation of the banks however, their political solution to the financial crisis does not go beyond the nationalisation of money. Marxists call this radical theory of capitalism ‘utopian socialism’ as in Marx’s critique of radical Ricardians and in particular of Proudhon. Marxism was a development of classical political economy, so Keynes return to Smith and the radicals return to Smith and Ricardo, are a return to a pre-Marxist political economy. Keynes system is a redistribution of income towards the social wage. It assumes equal exchange as did Smith. Radicals assume unequal exchange after Ricardo and want the state to intervene to equalise exchange. Marxism critiques both these theories as limited by the level of analysis. Marxists critique Keynesians as theorists of capitalist distribution. To illustrate this lets look at one ex-Marxist, James Heartfield, who has moved from Marx back to Keynes. Ironically, Heartfield was once a member of the British Marxist Revolutionary Communist Party that was founded on the economic analysis of David Yaffe who was heavily influenced by classic Marxists Paul Mattick and Henryk Grossmann. In a recent article Heartfield claims that the current crisis has nothing to do with a crisis of overproduction, but rather a ‘subjective’ psychological aversion of capitalists to productive investment that has led to speculation. Heartfield argues that a crisis of overprodution results from the TRPF and while the crisis of the 1960s could be seen as such, today the crisis originates in the sphere of finance. Steve of Marx Redux again has pointed to the arguments against this that Heartfield must be aware of. Of all the cases Heartfield could have chosen to illustrate supposed ‘subjectivism’ (aka psychologism), he made an unfortunate choice. There is absolutely nothing novel about the burgeoning of finance and its attempts to distance itself from capitalist production. The case of the money market is *precisely* the one which Engels uses in his classic letter to Schmidt (Oct 27 1890) about historical materialism to discuss the relative independence of certain social developments from production – without ever having to resort to a deus ex machina or any form of idealism. ‘A depression may “sneak” into existence by a gradual slowing down of economic activity, or it may be initiated by a dramatic “crash” with sudden bank failures and the collapse of the stock market. The crisis itself is merely the point at which the reversal of business conditions is publicly recognized. … Even the last phases of the boom preceding the crisis are, viewed in retrospect, already unprofitable; but recognition of this fact has to await the verdict of the market. Commitments made on the assumption of a continuous upward trend cannot be met. The conversion of capital from commodity to money form becomes increasingly more difficult. The crisis of production is at the same time a financial crisis. The need for liquid funds and the attempt to avoid losses intensify the fall of securities and commodity prices.’ p84. As for copy-editing Grossman, Heartfield seems to have skipped several pages, at the end of Chapter 3, where Grossman clearly, if briefly explains how the expansion into finance is actually a consequence and symptom of overaccumulation! ‘I have shown how the course of capital accumulation is punctuated by an absolute overaccumulation which is released, from time to time, in the form of periodic crises and which is progressively intensified through the fluctuations of the economic cycle from one crisis to the next. At an advanced stage of accumulation it reaches a state of capital saturation where the overaccumulated capital faces a shortage of investment possibilities and finds it more difficult to surmount this saturation. The capitalist mechanism approaches its final catastrophe with the inexorability of a natural process. The superfluous and idle capital can ward off the complete collapse of profitability only through the export of capital or through employment on the stock exchange.’ p 191 and so on for pages. As an alumni of the RCP, Heartfield seems to have forgotten, probably for good reason, ‘RC Papers’ tedious attack on Yaffe and Bullock’s ‘Inflation, the Crisis and the Post-War Boom’. There, several pages (22-26) describe in detail exactly the evolution of the financial crisis showing how it comes about precisely because of the constraints imposed by overaccumulation! 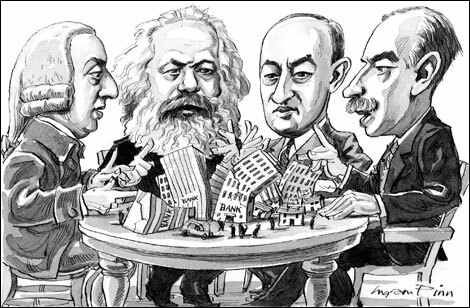 Although developed to explain the limits on state expenditure (since Keynesianism was still the dominant economic ideology) the article is virtually a tutorial on the relationship of Marx’s theory of credit to his theory of overaccumulation, and can readily be used to understand the current financial crisis. Heartfield is clearly well aware of these three sources which refuted him in advance. Yet he either fails to mention them or gives the impression that they don’t address the issue of the connection of the financial crisis with overaccumulation. So, on these long cold dark winter nights, drawn up a chair close to the fire, pull down volume three and take another gander through parts 4 and 5, perhaps with some help from Yaffe and Bullock, the latter end of Grossman’s chapter 3, and Mattick’s analysis of the Great Depression, all conveniently online … and reassure yourself that things are undoubtedly going to get worse – thanks to the overaccumulation of capital, not to the fleeting whims and tastes of capitalists. Not only does Heartfield abandon classic Marxism he arrives back at the distributional analyis of Keynes. Heartfields psychological causes of speculation are exactly the same as Keynes reference to ‘animal spirits’ of capitalists who choose to hoard rather than invest productively. It is the same failure of will on the part of the capitalist who ‘chooses’ to hoard or speculate. The thing about hoarding is that money inevitably loses value, speculation however creates the a fictitious value to disguise the loss of value. All that is needed is another dose of Keynesian state discipline to force the weak minded bosses to invest or else be punished by high taxes that the state will use to invest and reflate the economy. Like making spoiled children behave really. Problem is that the spoiled children do not want their toys taken off them, and rather than lose them they will destroy them. What is funny and unknown to many radicals, is capitalism was the first system to have equal exchange. We have some idea of what a hamburger costs at McDonald’s. It’s not I’m cold and you have squirrel skins, and your thirsty and I have a canteen of water. Yea, that’s hilarious. Those crazy radicals! What will they not think of next? Admittedly he doesn’t make it very clear, but I don’t think Heartfield is an idealist. Capitalists have an ‘aversion’ to investing in industry because the falling rate of profit means it’s not worth their while! Instead, the ‘developed world’ has increasingly switched to low-tech labour-intensive ‘services’: flipping burgers in McDonalds, manning tills in shops, changing sheets in hotels, etc. At the same time, masses of workers have been added to the worldwide labour-pool, most obviously in China, of course. The crash is thus not directly a crisis of oveaccumulation, because the organic composition of capital hasn’t much increased. It’s rather a hangover of the crisis of overaccumulation of the ’70s. Since then, the neoliberals have overseen deindustrialization (since the falling rate of profit makes it profitable to abandon industry) and tried to make up the difference with state subsidies (see Heartfield’s fun article on state capitalism: http://www.metamute.org/content/state_capitalism_in_britain), massive debt (both debt to Chinese industry and claims on future exploitation in the West, which are unlikely to be fulfilled), justifying deindustrialization with the growing green ideology that less is more. We can surely see how the crash and the Western economy’s complete reliance on debt fit together. When I wrote that Mattick’s ‘Marx and Keynes’ was not much noticed when it was published, I ought to have referenced the source, Paul Mattick Jr.’s introduction to ‘”Marx and Keynes” after thirty years”, a special issue of the International Journal of Political Economy, Winter 1999-2000 Vol 29, No 4. It really wasn’t ‘widely debated on the British left’ – which was for the most part not terribly interested in the critique of political economy, but preoccupied with getting Tony Benn to become deputy leader of the Labour Party. I had forgotten the issue of RC Papers Steve refers to, but not the argument within it. My point was only that a crisis of overaccumulation was not the reason for today’s dift into finance. When you write that I have ‘abandoned classic Marxism’, remember Marx said, ‘I am no Marxist’. All theory is open to revision, because reality does not have to conform to theory, and moreover, it changes. It seems a bit unfair to give me a digital kicking and then keep my reply as a comment awaiting moderation for weeks on end. That was an oversight. Busy elsewhere. Not be best way to keep marxism alive I admit. I think Marx first made that comment talking about his son in law Lafague who definitely wasnt into overproduction crises. I think the cause of the crisis is capitalism and its solution is socialism.